In second grade, we are working on double-digit subtraction with regrouping. They have caught on super fast. However, they have gone regrouping CRAZY! They will regroup anything and everything... which turns out to be a problem. 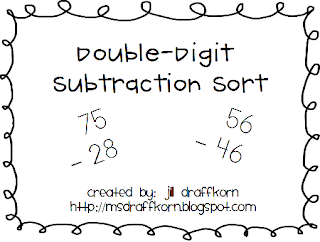 To help them stop and think before they regroup, I created this little double-digit subtraction sort for them to do today. Based on the subtraction regrouping poem, the kids will sort problems into groups based on whether they need to regroup or not. After they sort the problems into the "more on the top", "more on the floor", or "numbers the same" groups, they can take a problem and solve it on a whiteboard. Could you use this in your class? We're using it as a math work station. Click on the picture of the document to download it. Let me know if you use it!! This is the first idea that has come out of my own brain that I wanted to share so I am pretty excited!!! I agree with you, they get trigger happy and regroup every thing! I will try this with my kids soon. Thanks for thinking forward! Perfect Timing!!! I am so sick and need an activity for tomorrow. Thank you!!! Perfect activity for my high group in math! Thanks for sharing. I am your newest follower.